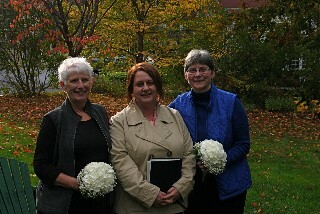 In October, I had the pleasure of performing a marriage ceremony in Bar Harbor, Maine. It was a day to remember and I’m pleased to be able to share the details. 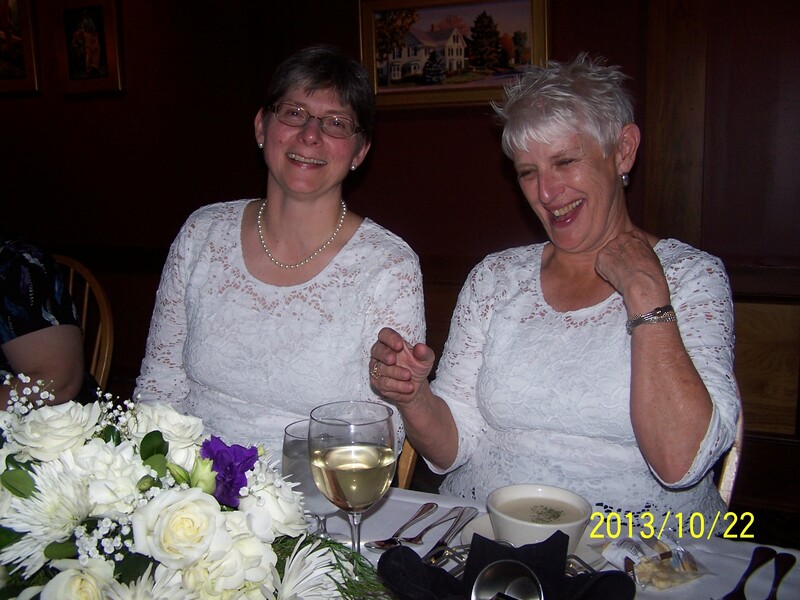 Rosie and Rosemary planned to marry at the summit of Cadillac Mountain in Acadia National Park when the federal government shutdown forced the park to close just a little more than 3 weeks before the wedding. Any hope of sneaking in was limited by the news that police were issuing citations for such misbehavior. 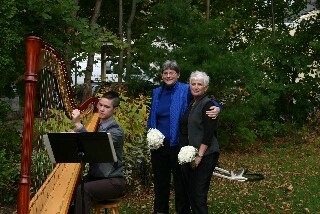 Molly Nichols, a classical harpist had been booked to play during the ceremony. Plans to hold the ceremony at the Graycote Inn were made in case inclement weather on the mountain risked damage to the harp. Just a few days before the ceremony, the shutdown ended and the park reopened. Yahoooo!!! The weather was clear, even sunny, during my drive to Bar Harbor. Skies began to turn gray as I entered the park. By the time I was three quarters of the way up Cadillac Mountain, the wind had picked up and rain began to fall. I chalked it up to a “passing shower”. When Molly arrived, the decision to have the ceremony at the Graycote was finalized. So we traveled back down the mountain and picked a spot on the lawn to hold the ceremony. Adirondack chairs rearranged in a half circle, the harp set up, and we were ready. There is something to be said for a couple who truly just wants to be married. Nothing more, nothing less. Rosie and Rosemary were this sort of couple. They and their guests took the last minute change of plans in stride. I ran to the town office to deliver the license and then met back up with the group at Galyn’s in Bar Harbor for dinner. What transpired there was just too much fun not to blog about. Molly set up her harp in a function room located toward the rear of the restaurant. A just-right sized room with an intimate feel. Not far from other patrons but somehow perfectly separated. Hors d’oeuvres of shrimp cocktail, crab cakes, seafood stuffed mushrooms and the best bacon wrapped scallops I’ve ever had were laid out. Noticed a seafood theme, didn’t you? Well, that’s because Rosemary and Rosie are from Georgia. Their guests were from as far away as New Mexico. When it came time for dinner, they all ordered seafood. But Molly and I (the only Mainah’s in the group) ordered prime rib….A fact pointed out before dinner was over. HaHaHa – We do have a tendency to take our seafood for granted up here. Galyn’s also served us some memorable sparkling wine, which I took note of and have looked for, but can’t seem to find on the grocery store shelves (hmmm….go figure). The company Rosie and Rosemary keep is colorful (that could be the understatement of the year). I did forewarn Molly about sitting next to Rosie’s brother David (who you can just tell is T-R-O-U-B-L-E), but she did it anyway. And it turns out Molly is not just an amazing harpist, but she is a remarkable entertainer in general. I don’t think anyone will soon forget her impression of the Maine accent. After dessert, we discovered that the multi-talented Molly also sings fabulously. There was somewhat of a sing-a-long when Molly began playing requests for Phantom of the Opera tunes to end the evening. My stomach finally stopped hurting from all the laughing we had done at just about the time I got home (two and a half hours later). I don’t believe anyone in the group wanted to see the evening come to a close. If you are planning a destination wedding in Bar Harbor or Acadia National Park, please call or e-mail me to reserve your date.